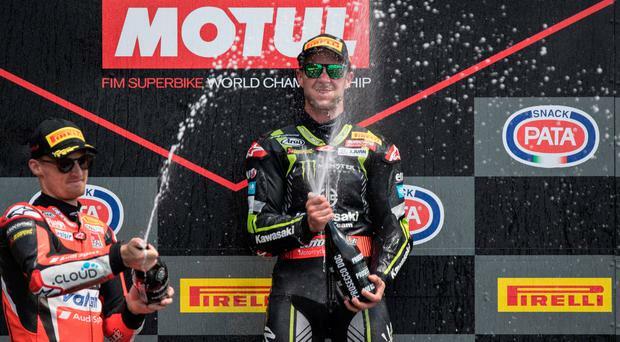 It was the perfect weekend for triple World Superbike Champion Jonathan Rea during the fifth round of the 2018 series at Imola, in Italy where he set pole position, won both races, set the fastest lap in both races and extended his championship lead to 47 points over his main rival Chas Davies, who finished second and fourth in the two races. To add the icing to the cake these were Jonathan's 58h and 59th World Superbike victories equalling the record held by Carl Fogarty - plus this was his 17th double victory, a new record and all in front of the main boss from his Kawasaki team in Japan. An ecstatic Rea (31) said: "This weekend was really good. We did not change much on the Kawasaki from the recent successful test we had at Brno in the Czech Republic. "Although Imola is a lot more of a stop-start circuit, the changes made by my crew chief Pere Riba gave me a brilliant bike. "To equal Carl's record is unbelievable, I think I was about 10 years old when he was setting records and you know it's something that I hadn't thought much about... but with a long season still in front of us I feel confident I can extend my win tally." Starting race one from his 16th career pole position, the Ballyclare rider never looked back, leading from start to win by 3.755secs from team-mate Tom Sykes. For Davies, two costly mistakes on the opening laps, running wide at turn six and then overshooting the final chicane, cost him any chance of challenging Rea and he finished in fourth position. After the win Rea commented: "There was no-one pushing me and I rode steady throughout." The win meant Rea was starting race two from ninth position and row three on the grid. When the lights went out to start the second 19-lap race, Rea was quickly on the move, scything past Sykes and Luca Savadori to be fifth at end of lap one, as Michael Reuben Rinaldi and Davies set the pace. By lap three, Davies, the pole man, hit the front with Rea snatching second after overtaking Rinaldi and the scene was set for a thriller between the two top men in the championship at the moment. What a battle it was in the middle part of the race, Rea able to get alongside Davies, but not able to make a pass. They were side by side, handle bar to handle bar, with some superb riding until lap 10 when the pair touched in one overtake attempt, then the decisive move at the Variante Alta when Rea hit the front, put in a couple of fast laps and the race was his. "I lost places in the first corner," Rea said, "but was then able to make a few passes and catch up on Chas. "I was able to relax a bit behind him and understand where I could pass him. I tried two or three times before I made it through, I just put my head down to get a gap and won the race." Toomebridge's Eugene Laverty finished the weekend with 12th in race one and ninth in race two, which he was not enthusiastic with, but considering his injuries from his Thailand accident he was philosophical saying: "I couldn't afford to crash, so I suppose you could say the weekend was a result for me. "I felt exhausted after race one, but a good bit better in the second race. "It was a tough circuit to make a comeback as it is physically difficult and sets me up for Donington in a couple of weeks' time." In World Supersport, Carrick's Andrew Irwin made it two points scoring races in succession taking two points for a 14th-place finish. Results, Race 2, Sunday: 1 Jonathan Rea (Gbr) Kawasaki 34mins 03.420secs, 2 Chaz Davies (Gbr) Ducati 34:07.439, 3 Tom Sykes (Gbr) Kawasaki 34:12.950, 4 Javier Fores (Spa) Ducati 34:17.579, 5 Jordi Torres (Spa) MV Augusta 34:18.899, 6 Alex Lowes (Gbr) Yamaha 34:19.582, 7 Michael Rinaldi (Ita) Ducati 34:20.617, 8 Topak Razgatlioglu (Tur) Kawasaki 34:20.974, 9 Eugene Laverty (Gbr) Aprilia 34:25.751, 10 Leandro Mercado (Arg) Kawasaki 34:33.596. Riders: 1 Jonathan Rea (Gbr) Kawasaki 209pts, 2 Chaz Davies (Gbr) Ducati 162, 3 Tom Sykes (Gbr) Kawasaki 137, 4 Marco Melandri (Ita) Ducati 131, 5 Javier Fores (Spa) Ducati 124, 6 Michael van der Mark (Ned) Yamaha 113, 7 Alex Lowes (Gbr) Yamaha 92, 8 Topak Razgatlioglu (Tur) Kawasaki 58, 9 Loris Baz (Fra) BMW 52, 9 Jordi Torres (Spa) MV Augusta 52.